Bombshell: The Hedy Lamarr Story is out on DVD 23rd April, 2018. And to celebrate we have a great competition for you and 3 copies on DVD to give away. Hedy Lamarr was iconic. A Hollywood star known as ‘the most beautiful woman in the world’, she inspired both Snow White and Catwoman with her striking looks and distinctive persona. As famous for her performances as she was infamous for her multiple marriages and affairs with the likes of Spencer Tracy and JFK, Hedy Lamarr (Ziegfeld Girl, Samson and Delilah) was enigmatic. There was substance behind the beauty, though; a side to her far more interesting than the spotlight of stardom. She was a maverick, an ingenious inventor whose pioneering work helped revolutionise modern communication. Her groundbreaking concept of frequency hopping is now used as the basis for secure Wi-Fi, GPS and Bluetooth. We have far more than beautifully poised performances to thank her for. 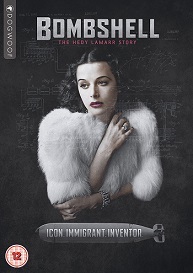 Produced by Academy Award® winning Susan Sarandon, as well as Michael Kantor and Regina Scully, BOMBSHELL: THE HEDY LAMARR STORY finally gives Hedy the voice denied to her by Hollywood. In 2016, director Alexandra Dean and producer Adam Haggiag unearthed four never-before-heard audio tapes that detail her incredible life, lending the documentary an irresistible first person account; as well as being narrated by Hedy’s family, closest friends and admirers including Diane Kruger, Mel Brooks and Robert Osborne. Experience Hedy Lemarr in her own words and discover the magnificent woman that is finally getting the credit she truly deserves as an icon and inventor, when BOMBSHELL: THE HEDY LAMARR STORY releases on home platforms. Who Directs Bombshell: The Hedy Lamarr Story?